San Diego Harley-Davidson® earned the prestigious Bronze Bar & Shield Circle of Recognition Award for 2017. 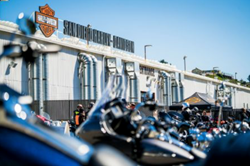 Bronze Bar & Shield Award recipients, like San Diego Harley-Davidson, consistently elevate the brand by providing their customers with exceptional and authentic Harley-Davidson experiences. San Diego Harley-Davidson® earned the prestigious Bronze Bar & Shield Circle of Recognition Award for 2017. Presented by Harley-Davidson Motor Company, this award is given to dealers based on motorcycle and related product sales performance, customer service and satisfaction, and operational measures. San Diego Harley-Davidson consists of two full service dealerships, Morena Blvd and Kearny Villa, plus a gift shop in Seaport Village. They are family owned and operated by proud veterans and consistently give back to the community. In 2013, the largest Harley-Davidson® Dealership in California opened as San Diego Harley-Davidson’s main location on Morena Blvd off the I-5. The impressive space offers extraordinary Motorcycle Sales, Parts, Service and MotorClothes Departments, along with Rebel Hair & Tattoo Shop, a Convenience Store and a dedicated Event Room.